Have you eaten at a Jose Garces restaurant? He’s got almost 20 restaurants spanning 6 states. We are fortunate enough to have one in Scottsdale, AZ. He has a great twist on Latin American food… and great ceviches. Having been to Distrito at the Saguaro Hotel in Scottsdale, we were hooked. But Scottsdale in now a long way from home for us… so we bought his cookbook and thought we’d try our hand at home. There’s this recipe in his Latin Evolution cookbook for a sous vide chicken that we thought we’d try. It seemed simple enough. I roasted some potatoes that I tossed in olive oil and fresh rosemary. i sous vide the chicken in a mixture of roasted garlic, cream, fresh thyme, truffle oil, and salt at 155F for 4 hours. I made a ‘broth’ of chicken bones, garlic, carrot, onion, tomato and tomato paste + a couple tablespoons of truffle oil. Suffice it to say… it was EXCELLENT! I served it with a bit of truffle cream and a fried egg on top. 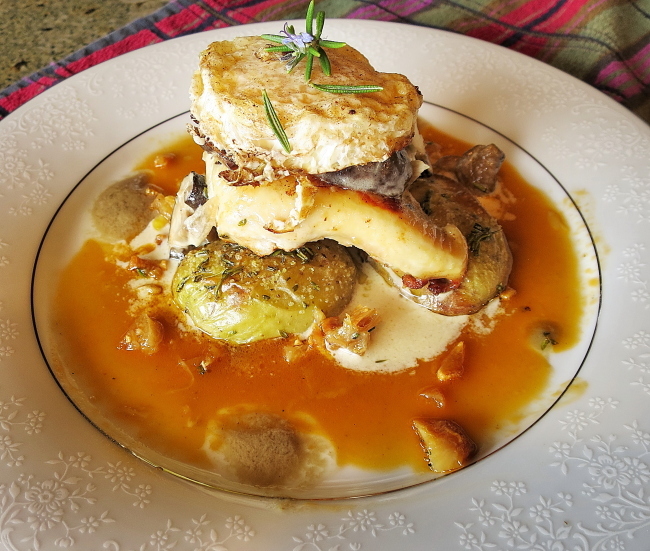 This entry was posted in What's For Dinner and tagged chicken, jose garces, latin evolution, mushrooms, sous vide on July 25, 2015 by kritterspaw.